The new Agriculture Bill passed its second reading in Parliament on the 10th October 2018 and it now goes to Committee Stage which is required to be concluded by no later 20th November 2018, with the Public Bill Committee’s first meeting taking place on the 23rd October. Following this it goes to the Report Stage, followed by a final reading in the House of Commons before it then goes before the House of Lords (please see the progress of the Bill here). The Bill is described as “an “enabling” Bill containing 25 delegated powers with five of these allowing Ministers to modify Primary legislation”. The aim is to set up the legislative framework necessary to enable the UK government to administer and regulate its own independent agricultural policy following leaving the EU, and sets out the framework for DEFRA’s future Environmental Land Management Policy. This is a different approach to providing support to farmers/land managers compared to the existing BPS subsidy scheme, and instead focuses on protecting and enhancing the environment (rather than the existing EU CAP policy of direct support payments based on the area of eligible agricultural land farmed). The UK Government believes “… Common Agricultural Policy Payments have failed to reward some public goods adequately, such as measures to improve water quality and soil health. While agri-environmental schemes (Pillar 2) have produced evidenced benefits, government considers that overall, CAP has not been effective enough at reversing environmental damage caused by agriculture”. The replacement support mechanism will be introduced during the UK transition period of up to seven years (during which direct support payments will be phased out in stages) following the initial EU transition period from 2019 to 2021. They expect trials to run from 2019 to 2022, and pilot schemes from 2021 to 2024, and from 2025 therefore the government proposes that new Environmental Land Management Schemes (ELMS) will be fully up and running in England and Wales (see DEFRAs Health & Harmony consultation timeline 2018). (Scotland & Northern Ireland’s devolved governments have their own proposals for how to support their farmers/land managers following the Brexit transition period ending in 2021). 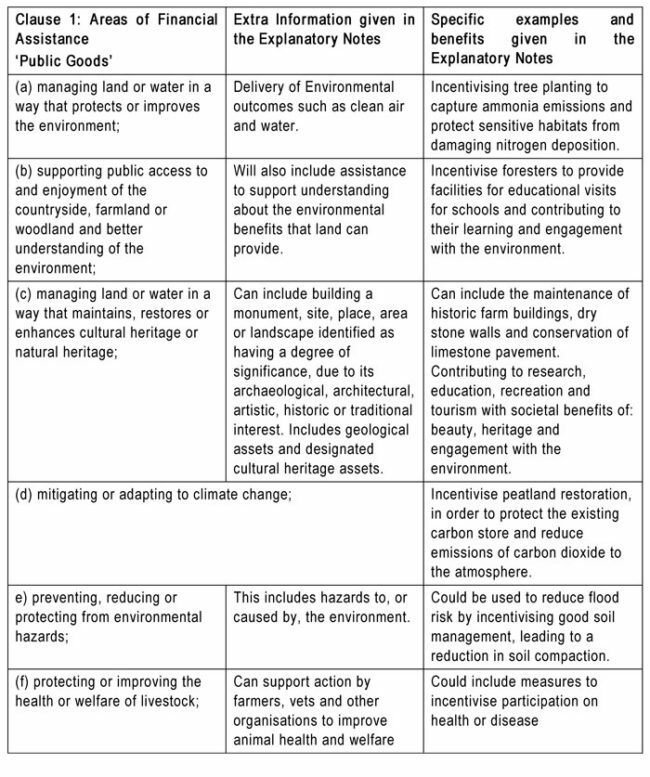 The stated aim of the new ELMS is to give support to farmers/land managers by providing “public money for public goods” and the table below, taken from the Commons Library Briefing Paper on the Agriculture Bill, published on the 9th October, sets out the current definitions of “public goods” as shown below. There is pressure from some stakeholders for the government to also include support for improving farm productivity and food production. For the last 70 years, since the end of World War II, it has been an important government objective to ensure that the nation supported farmers and food production. However at present the proposed new scheme specifically avoids mentioning support for food production, most likely due to a wish to have built in compliance with WTO rules which specifically limit food production subsidies to avoid unfair competition between nations. Encourage land managers to use more sustainable practices and reduce negative impacts by making capital grants available. Stricter penalties could also be applied to those landowners who choose not to access funding to solve some of the challenges. Landowners could also be looking at stricter penalties if the Government adopts a fuller “polluter pays” approach. The existing agri-environment schemes are the four main Countryside Stewardship Schemes, being the Mid Tier, Higher Tier, Wildlife Offers and Capital Grants. One of these elements is non-competitive (i.e. if you apply and can meet the requirements, you will receive the payment), and three are competitive, where not all applications are successful (although some Capital grants can be non-competitive); applications are evaluated and only the ones that best meet the environmental targets and priorities in any area are accepted. Once an agreement is granted they provide guaranteed payments over a set period (usually 5-10 years) for carrying out certain environmental activities, to cover the additional costs of farming in certain environmentally friendly ways, to undertake planting specifically to improve the variety of trees, wild plants, birds and wildlife, and to assist in improving the land and boundaries. The capital grants are for work such as improving hedgerows/boundaries, restoring historic buildings, woodland grants, or for preparing an application for a Higher Tier agreement which can require expensive reports to be submitted with the application. The application process for even the lowest level CSS involve the completion of a paper application form, plus the preparation of numerous reports, and supplying photographic evidence, and even when applications are accepted and a CSS agreement is granted, claims have to be submitted each year providing fresh evidence of compliance. Subject holdings are then subject to random inspections throughout the year, sometimes with only 24 hours’ notice, to check for compliance, with penalties being applied for non-compliance with sometimes stringent requirements in respect to documentation. However the scheme has suffered from poor administration, slow response times, and in some cases crippling delays in making payments. Whatever new agri-environment scheme is set up to replace CSS, it hopefully it will re-build farmers/land owners’ confidence that the government subsidies will be better administered, that the application process is streamlined, and that the payments are made on time. The Government states it intends to offer “fair rewards and strong incentives for participation [in an ELMS]”, however at this stage the requirements for entry and the formulas for calculating the level of payments to be made are also still to be debated and agreed. The funding has currently only been guaranteed until 2022, the end of the current government, but there are calls from various stakeholder groups for the government to commit to a long-term budget to allow for clear business planning and investment by farmers/land managers. Whatever support schemes are eventually made available, will need to fit in with farm and land management business plans, and as they cannot be compulsory (unless there are penalties for environmental failures), the Government will want to ensure the new schemes make financial sense for farmers to take part. The costs of joining the schemes should be less than the benefits to be received – farmers/land managers must make a profit, or there is a chance they won’t be taken up, particularly following the difficulties experienced with the existing CSS schemes. The current proposal that seems to be gaining traction is that Land Management Plans be developed by the farmer/land manager with help from their land agent/specialist environmental advisor, and Land Management Contracts then issued for the provision of environmental goods and services based on these Land Management Plans (LMP). This seems to imply that the Government is leaning towards the CLA proposal, set out in their “The Land Management Contract” (LMC) document published in May 2018, which suggests that some non-competitive grants (Universal LMCs) should be available to all land managers to conserve and manage the land in an environmentally friendly way, and some competitive grants (Enhanced LMCs) offered to enhance and restore landscapes and farm holdings. In addition there may be a grant to provide funding to apply for an Enhanced LMC. It is expected that these LMPs would need to be developed by the farmer/land manager with some help from “specialist advisors” such as land agents/environmental consultants. It is yet to be seen whether the Government will also provide financial support for farmers to prepare at least their initial Land Management Plans, perhaps in a similar way to the Farm Business Advice support offered to farmers following Foot & Mouth in 2001. There is also the Payment By Results scheme which is currently being trialled in Norfolk & Suffolk, and also in Wensleydale in Yorkshire. This is the first agri-environment support scheme directly funded by the UK Government, and was offered to specifically targeted areas where environmental improvement is needed. For instance in Norfolk and Suffolk farmers are benefitting from planting nectar plots for bees and other pollinators, while those in Wensleydale are focused on managing species-rich meadows. DEFRA state that “all the funding for the Payment by Results (PBR) pilot will come from DEFRA, with a £540,000 boost announced today (2.8.18) to pay farmers according to the environmental outcomes they achieve over the next two years”. It is highly unlikely that this approach would be appropriate to all farmers/land managers, but could provide extra support for particular target areas. The feedback from lobbying groups representing landowners/farmers/environmental & wildlife groups is overall fairly positive about the principles of ELMS as set out in the draft Agriculture Bill 2018 and the definition of “public goods” eligible for “public funds”. However there is also pressure for this definition to be expanded to include “rural vitality and national health and wellbeing” and also “public benefits that are delivered by sustainable farming and forestry practices” (CLA Briefing 9.10.18); and that “supporting domestic agriculture to ensure food security and stability of food supply” should also be recognised as a public good (NFU 10.10.18). All stakeholders would prefer more certainty on the funding to be provided post-2022, and highlight the difficulties for farmers/landowners planning long-term investments in their farming/environmental practices without such certainty. Most stakeholders also welcome the promise of reducing red-tape and simplification of the application process, but environmental and wildlife groups in particular also stress the importance of robust oversight of the benefits, and feel effective regulation will be key. ELMS will therefore most likely be the cornerstone of agricultural policy in England and Wales post-Brexit. It is clear that after the UK transition period farmers/land managers in England or Wales will need to apply for an ELMS (or whatever the final scheme is called) to receive any Government funded financial support, and it is likely that an application to whichever body eventually administers and regulates the scheme will require some kind of environmental audit of their land, whether done by the farmer, or with the support of a land agent/environmental consultant. How the application is submitted, and how much detail will be needed, is yet to be confirmed, bearing in mind that the Government’s intentions, as set out in the Agriculture Bill Briefing Note dated 9.10.2018, are to “simplify the 2019 Countryside Stewardship application process in England, within the rules of the implementation period” and “reduce the bureaucracy” and “any needless paperwork, which has been widely criticised”.